KEEP YOUR EYEWEAR STREAK-FREE AND SCRATCH-FREE WITH OUR OPTIPLIX STARTER CLEANING KIT! OptiPlix brings you a three-piece eyeglass cleaning kit that you have been looking for. Included in this set is an eyeglass case, an eyeglass cleaner spray, and a microfiber cloth cleaner. 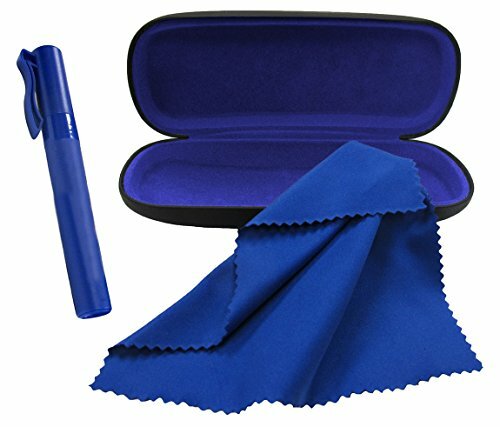 Our microfiber cloth cleaners come in various colors that also match the color of our eyeglass spray and the cloth inside of the eyeglass case. Used with or without cleansing liquids, you can wipe off your eyeglasses without having to worry about hideous scratches, marks, and dents! The eyeglass cleaner spray also comes in a uniquely designed bottle that resembles a pen--making it stylish, small, and extremely portable. Slip this "pen" cleaner spray into your pocket, handbag, and more without it taking up too much space. The eyeglass case also matches the microfiber cloth so you have a matching set! This eyeglass case is both hard and durable to ensure that your glasses do not get bent, broken, or damaged while stored in here. Keep your eyeglasses clean and safe with the Optiplix cleaning kit. With our cleaner starter kit you will never again reach for a tissue to wipe off your lenses; you will not struggle to find a safe place to store your glasses; and you will also never have to bring a huge bottle of cleaning spray with you wherever you go! So what are you waiting for? Buy this amazing time-saving, affordable, and problem-solving eyeglass kit today! UNIQUE SET: OptiPlix's 3 piece cleaner starter kit features a 6x7 microfiber cloth, a pen shaped eyeglass cleaner spray, and a 16x6x3 cm hard eyeglass case. With this portable kit, you can rest assured that your glasses will always be clean and safe. CLEAN & SAFE: With our portable cleaning spray, microfiber cloth, and the soft lining of our glasses case, the lenses of your glasses will be protected from scratches, and its arms from bending and breaking. It will also be safe from dirt, dust, and grime. STANDARD SIZE: Our eyeglasses holder is manufactured to fit most standard sized glasses and sunglasses. Its compact design is also a huge advantage because it saves space, so you will certainly have a place to keep your glasses safe, no matter where you put them. WONDERFUL GIFT IDEA: Because of the great use that everyone can get out of this product, it is a perfect gift for men, women, and children. Featured in many colors, it can suit whoever you choose to gift it to, making this the perfect unisex present. 100% SATISFACTION GUARANTEED: With all OptiPlix products we can always guarantee our customers 100% satisfaction. We love to make items that make your daily life easier, and we take pride in creating products that never disappoint in solving day-to-day problems. If you have any questions about this product by OptiPlix, contact us by completing and submitting the form below. If you are looking for a specif part number, please include it with your message.